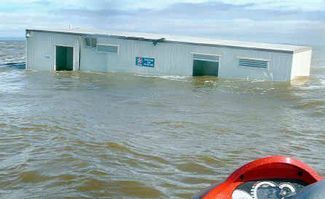 There haven’t been many light moments throughout the Queensland floods, however the case of the ‘floating loo’ did raise a few chuckles. In a previous life, this was a portable toilet block from a service station in Maryborough. The flooded Mary River decided it needed some sea air and kindly transported it into Hervey Bay, where it was spotted (and photographed) by local jet ski operators, Aquavue Watersports making its way to Fraser Island for a bit of R & R. The Fraser Chronicle reported that the the toilet was still usable, but the paper wet! Natural disasters have a way of reminding people what the important things in life are. When panic buying set in, it wasn’t Camembert cheese, pate or fine red wine that went, but the basics – milk, bread, batteries (no electricity remember) and toilet paper. Suddenly I could see the benefit of having a husband who liked to ‘stock up’ on grocery items. We have copious cans of fish, enough coffee to last 6 months and as for toilet paper…there are so many rolls sitting silently, waiting their call of duty in our bathrooms, I momentarily had visions of setting up a toilet roll stall at the top of our driveway and selling them for a hugely inflated price. But it was only a temporary moment of madness. Toilet wrap monopoly doesn’t have much glamour. Apparently some shop keepers came up with the same idea and there are stories circulating of rolls being sold for princely sums!!! In the Badlands (read marooned western suburbs of Brisbane) toilet paper may even become the new currency.